Peptide KPRSGLEEAQRRQAS(C), corresponding to amino acid residues 2-16 of rat ASIC3 (Accession O35240). Intracellular, N-terminus. Homology Mouse - 14/15 amino acid residues identical; human - 11/15 amino acid residues identical. 1. Anti-ASIC3 Antibody (#ASC-018), (1:200). 2. Anti-ASIC3 Antibody, preincubated with the control peptide antigen. Rat trigeminal ganglia (1:400) (Yan, J. et al. (2013) Headache 53, 1250.). Kellenberger, S. and Schild, L. (2002) Physiol. Rev. 82, 735. Chen, C.C. et al. (2002) Proc. Natl. Acad. Sci. U.S.A. 99, 8992. Price, M.P. et al. (2001) Neuron 32, 1071. ASIC3 is a member of a family of Na+ channels that are activated by external protons. The family includes four additional members: ASIC1, ASIC2, ASIC4 and ASIC5. The ASICs are in fact part of a larger superfamily named degenerin/epithelial Na+ channels (DEG/ENaC) and share with it the same basic characteristics: two transmembrane spanning domains, a large extracellular domain and short intracellular N- and C-termini. The functional channel is composed of 4 subunits that can be assembled as homo- or heterotetramers with the other ASIC subunits. A drop in external pH opens the channel resulting in an inward cation current that is quickly inactivated even in the continuous presence of protons in the medium, although a small residual current may persist. Several lines of evidence indicate that ASIC3 may function as a pain sensor. First, it is specifically located in dorsal root ganglia (DRG) neurons and in nociceptors that are involved in pain detection and transmission. In addition, in conditions such as inflammation and cardiac ischemia that include tissue acidosis and thus pain, ASIC3 currents have been detected. Finally, ASIC3 deficient mice display altered sensitivity to high intensity pain produced by heat or acid. Interestingly, while in rats ASIC3 is expressed almost exclusively in DRG neurons, in humans its expression is more widespread suggesting a more extensive role in human nociception. Expression of ASIC3 in rat trigeminal ganglia.Immunohistochemical staining of rat trigeminal ganglia (TG) sections using Anti-ASIC3 Antibody (#ASC-018). 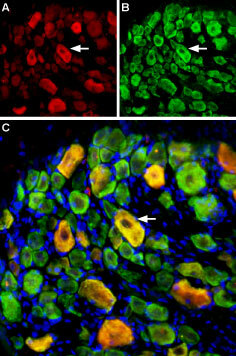 ASIC3 staining (green) appears in TG neurons (left panel) and coincides with FAST DiI staining (red), (right panel).Adapted from Meng, Q. et al. (2015) Am. J. Physiol. 309, C1. with permission of The American Physiological Society. Anti-ASIC3 Antibody (#ASC-018) is a highly specific antibody directed against an epitope of the rat protein. The antibody can be used in western blot, immunocytochemistry, and immunohistochemistry applications. It has been designed to recognize ASIC3 from rat, human, and mouse samples. Wu, Y. et al. (2017) Cell. Mol. Neurobiol. 37, 635. Mouse bone marrow derived macrophage (BMM) lysate. Kong, X. et al. (2013) Cell. Immunol. 281, 44. Xiong, Q.J. et al. (2012) Am. J. Physiol. 303, C376. Tong, J. et al. (2011) J. Immunol. 186, 3686. Yan, J. et al. (2013) Headache 53, 1250. Mouse anterial synovial sections (1:500). Kolker, S.J. et al. (2010) Ann. Rheum. Dis. 69, 903. Radu, B.M. et al. (2014) Cell Biochem. Biophys. 68, 9. Mouse synoviocytes. Also tested in ASIC3-/- mice. Ohbuchi, T. et al. (2010) J. Physiol. 588, 2147. Akiba, Y. et al. (2008) Gut 57, 1654. Ye, J.H. et al. (2007) Biochem. Biophys. Res. Commun. 355, 986. ASIC3 Channel Overexpressed Membrane Fractions (#LX-100). The ASIC3 overexpressed membrane fractions enables end users to check the expression of endogenous ASIC3 as opposed to a tagged version and serves as a positive control for testing the expression of the channel and a quick way to test the antibody. ASIC3 Channel Antibody and Membrane Fractions Kit (#LK-100). This kit includes the ASIC3 overexpressed membrane fractions, and Anti-ASIC3 antibody (#ASC-018). Guinea pig Anti-ASIC3 Antibody (#AGP-052) is raised in guinea pig and can be used in immuno-colocalization studies in conjunction with any of our antibodies raised in rabbit. This antibody has been raised against the same epitope as #ASC-018.